As with most of the foodie people I know, I met Fallon via the world wide web. Fallon Clark is a Certified Nurse Assistant, health and fitness writer, and an at-home chef. She has her own fantastic blog My Gluten Free Quest - where she talks about her own struggle with Celiacs disease. I love her because she strives to use locally organic grown produce. A vegan and gluten-free, made from the FRESHEST of ingredients, Curry dish. I know you'll love it and you'll be extremely inspired by Fallon as well. Read below to get the recipe and story behind it-------------------enjoy! 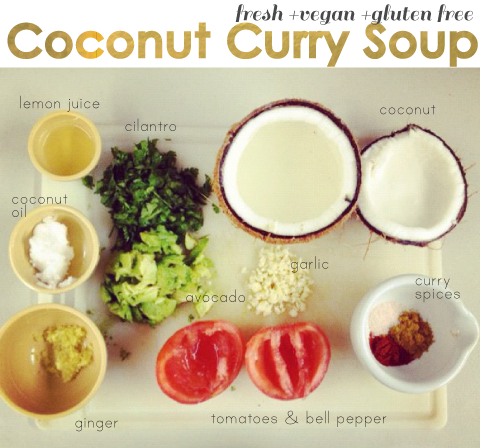 I came up with this yummy dish one day a while back when I was experimenting with coconuts. As I began mixing together what I thought would be irresistible when paired with the coconut, I began adding the citrus of lemon and cooling calm of avocado. I am nothing short of obsessed with spicy foods, mainly ginger and cayenne, so it's no wonder they made it into the mix. I cannot even describe how amazing this recipe tastes, so I suggest you wip it up yourself! It is really simple to do, and believe me it's worth the effort of digging out the coconut. When I made it again today I was so excited to smell all of the yummy produce together that by the time it was ready to eat I had an entire bowl in less than a minute. That sounds bad, but it's that good. Not only does this soup taste good, but it is also good for you! It's full of essential nutrients and health benefits. The vegetables and coconut in this recipe make this soup highly nutritious and rich in fiber, vitamins, and minerals. The coconut and avocado provide it with healthy fats as well which make this a heart healthy meal. The ginger aids in digestion and the spices boost your metabolism. Raw garlic helps prevent disease and fights of illnesses. In short, this is one recipe you definitely won't regret eating! Gather your necessary ingredients and wash all produce. Open the coconut and drain. Scrape out the meat. Blend. Place the rest of the ingredients (except for the extra coconut water, bell pepper and cherry tomatoes) in the blender and blend until smooth. Leave some cilantro aside to garnish later. If you are able to get all of the meat out of the coconut, it may not blend easily. This is when I suggest adding about 1 1/2 cups of extra coconut water. You may add as much as you need to based on how you like the consistency. Personally, I like it to be thick. You may chill in the fridge for a couple hours to allow the flavors to set, however this may not be possible if you have the urge to dig in right away! Pour into bowls to serve and garnish with diced bell pepper, tomatoes and cilantro. Stir before serving. I hope you enjoy my recipe as much as I do! Enjoy! November 14, 2012 by Juli Novotny.